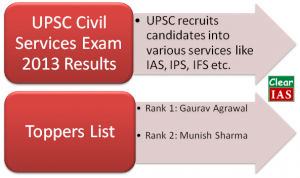 UPSC Civil Services Exam 2013 Results are out! UPSC declared the results for Civil Services Exam 2013 which was over by June 5 2014. In order of merit, candidates have been recommended for appointment to: (i) Indian Administrative Service; (ii) Indian Foreign Service; (iii) Indian Police Service; and (iv) Central Services, Group ‘A’ and Group ‘B’. Gaurav Agrawal is the all India topper. A total number of 1122 candidates have been recommended for appointment. The Commission is maintaining a consolidated Reserve List of 210 candidates. Marks are likely to be available on the UPSC website within 15 days. 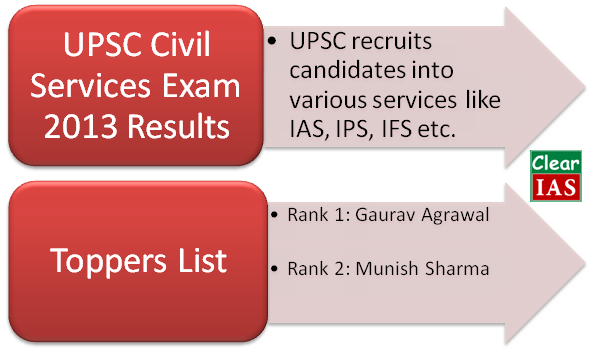 UPSC Civil Service Exam is a one-year long exam which has three stages ie. Preliminary, Mains and Interview. UPSC Civil Services Preliminary Exam 2013 was conducted in May 2013, Mains Exam in Dec 2013 and Interview (Personality Test) in April-June 2014. ClearIAS.com congratulates all toppers who made it to the final rank list. And for those who didn’t make it this time, we stand with you for all your future efforts. Get back stronger! Civil Services aspirants are always interested to hear the interview experiences and preparation tips right from the mouth of interviewees. Whether or not qualified in the final rank list, all 3000+ who made it to the interview list are invited to share their interview experiences in ClearIAS.com. We hope this program will act as a huge morale booster for future candidates. Interested candidates who gave UPSC Civil Services Interviews in 2011, 2012 or 2013 can share their story, experience, preparation methods, and success tips. Marks and other details can be updated later on the same post later. For model questionnaire and details contact us at : contactus[at]clearias[dot]com, highlighting UPSC Interview in the subject line. Mr.Gaurav Agrawal (Roll No.249085), topped the Civil Services Examination, 2013 with Economics as his optional subject. He has graduated with B.Tech. (Computer Science) degree from IIT, Kanpur and PGDM from IIM, Lucknow. This was his second attempt. Mr. Munish Sharma (Roll No.016290) who secured the second rank, graduated with degree in B.Sc.(Biochemistry). This was his second attempt. Educational qualification-wise the top 25 candidates comprise of 9 candidates belonging to Engineering; 3 candidates belonging to Medical Science; 4 candidates belonging to Sciences; and 9 candidates belonging to Commerce, Humanities & other Social Sciences background. 1122 candidates ( 861 males and 261 females ) including 30 Physically Handicapped candidates have been recommended for appointment to the IAS, IFS, IPS and other Central Services against 1228 reported vacancies. UPSC has a “Facilitation Counter” near Examination Hall in its campus. Candidates can obtain any information / clarification regarding their examinations / recruitments on the working days between 10:00 hours to 17:00 hours in person or over telephone Nos. 23385271 / 23381125 / 23098543.